To appreciate Charles Kingsley's description of "The Little White Town which slopes upward from its broad river tide" make sure you approach this ancient port and market town from "East the Water" and cross the ancient Long Bridge which spans the River Torridge. The view today has changed little since Kingley's sojourn here over 150 years ago whilst penning his novel "Westward Ho!". 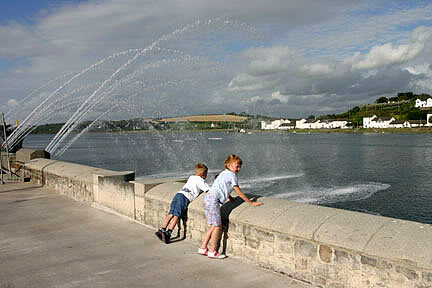 Nowadays Bideford Town is the thriving centre for the Torridge District with many modern amenities. Now definitely in the 21st century with the impressive new Torridge Bridge up river and the recently enhanced quay Bideford 2011 still retains its old charm. It is equally well known for its great shopping, large number of lively pubs, variety of places to eat and popular night spots. If you wish to enjoy Bideford at a more sedate pace you can stroll around the town exploring the narrow streets with brightly coloured shops selling everything from local fudge, arts & crafts, fresh local produce and general goods to the latest fashions and sportswear. There are cafes, restaurants and takeaways serving food to suit every palette and a choice of traditional inns or theme bars where you can eat or drink in or al-fresco. Take a "turn" around Victoria Park and enjoy the excellent colourful floral displays or sit by the quayside and watch the world go by. 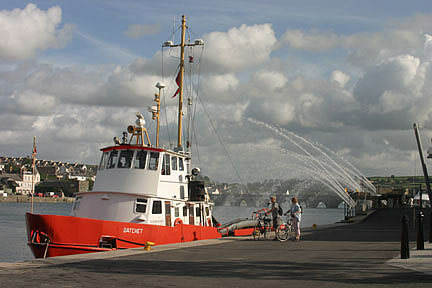 At high tide there is plenty of action, this busy port is in regular use by local fishing boats, all manner of pleasure craft, large container vessels and the Lundy supply ship "HMS Oldenburg". The Oldenburg is also a passenger ferry with regular pleasure trips to Lundy Island - you can find out about sailings from the Lundy Office on the Quay. The headquarters of the Bideford Amateur Rowing Club is conveniently positioned opposite the main Quay Steps affording easy access to the river. Rowers simply haul their "skulls" across the road and down to the water's edge. Across the water lies Brunswick Wharf where the historic schooner, Kathleen & May, was lovingly restored and is now a favourite tourist attraction. 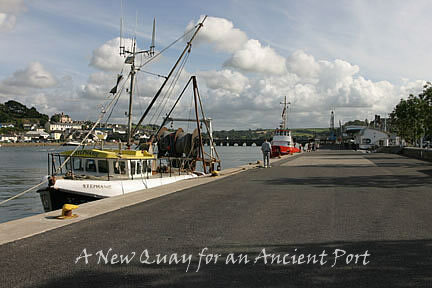 If you want to learn about Bideford and its history call in at the Burton Art Gallery & Museum or the Bideford Library. 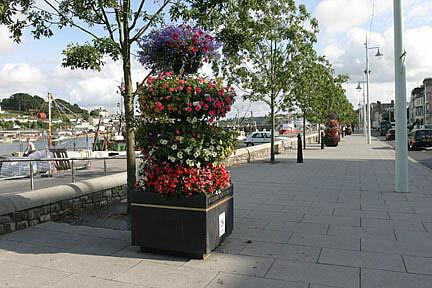 For more up to the minute information, Bideford Tourist Information Centre, at the entrance to Victoria Park will be able to tell you about the "Town Trail", local events, leisure activities, accommdation, nearby attractions and much more. Don't forget to include the top of the town and visit Bideford Pannier Market. The ancient covered Market Hall, Butchers Row and Market Place Shops have all been restored. The Panner Market is on Tuesdays and Saturdays, however, the Market Place Shops and Butchers Row are open six days a week. Around the market place there are excellent inns, a café/gallery, nightclub and bar. If you would rather not walk and prefer to drive up to the top of the town there is ample parking or a free bus is available. Bideford is a lively, popular place no matter what time of the year with many traditional annual fun events including the Bideford Folk Festival, Bideford Regatta, Bideford Water Festival and Bideford Carnival. It is also reputed to be one of the best locations in the Country for New Year Celebrations. The town puts on a host of activities, is closed to traffic and revellers enjoy the festivities in fancy dress. Thousands of people gather on the quay and along the old long bridge and wait for the town hall clock to strike midnight.